This essay is about the reticular system – the core of your brain. Buried deep beneath other brain layers, but interconnected with all of them, it’s central to all brain functions. Every thought, feeling, and perception – all mental activities in all brain systems – are rooted in reticular activity. It’s the hub of the brain wheel. Often called the “reticular activating system,” it energizes the brain. It activates and deactivates other systems, turning them on and off, shifting energy and awareness from one to another. It controls sleep-wake cycles and background levels of arousal and alertness. It generates and directs the focused spotlight of attention. It’s the energy source for thinking, feeling, and perception. It activates you – generates drive, motivation, and will. The reticular system is the functional core of your brain and mind. All of that is now firmly established by a century of brain research. But science still provides no definite answer to this central question: does the reticular system generate its own core awareness? It activates consciousness in other brain systems, and many think it does the same thing in its own core networks. So far there’s no proof, but accumulating evidence supports the idea of reticular consciousness. It has intrigued some scientific thinkers for decades, and is now attracting wider attention. It concerns our basic psychological and even spiritual nature. This essay explores that emerging view. So here is your sense of a center, a psychological core of primal awareness, an innermost sense of being. Here is deep intuitive and existential awareness, the “core of your being” experience. Here’s your sense of the infinite, and spiritual awareness – your sense of a soul. Such ideas have been advanced by various scientific thinkers over the years. Again, there’s no proof, but accumulating evidence, and those views are increasingly common. A new picture of reticular awareness is emerging. To set the stage, we’ll start with some brain basics. Here’s a two-page simplified overview, which avoids technical terms and should be an easy read. The diagrams illustrate our five major brain systems. The reticular system and limbic system are covered by other brain layers and can’t be seen on external view. You probably know that the cerebral cortex is the large outer “thinking” layer, and that beneath it the limbic system regulates feelings and emotions. You’re probably familiar with the stalk-like brainstem, which controls basic sensations, body functions, and instinctive drives. You may have heard of the cerebellum, long known to balance the body and coordinate its movements. But we now know it has balancing and coordinating influences on all brain functions, similar to its influence on body movements. More about that in Essay 2. And now you know that your brain has a core. Running lengthwise through the center of the brainstem, and interconnected with all other systems, the reticular system is the brain’s functional hub. It’s the activating core of the brainstem, limbic system, cerebral cortex, and cerebellum. In many ways the brain is like a computer, and these five systems are its main functional units. Each has its own wiring pattern, its own programs and functions. Highly interconnected and always interacting, they shape all our experience and behavior. Each system contains billions of neurons – long, microscopically thin nerve cells, specialized to conduct electrical signals. Every neuron is a tiny biological wire, conducting its own bits of information. Brain pathways are cable-like bundles of many neurons. Pathways are the cables, and neurons are the wires that make up the cables. They carry information, coded in their electrical patterns, from one part of the brain to another. Brain systems consist of many pathways, organized and working together to perform particular functions. In our overview map, we have five major functional units, or basic brain divisions, each containing many systems performing various related functions. So the neurons in your brain are organized into pathways, pathways into systems, and systems into five major functional units. Working together they generate your mind. But how do they do that? How do brains produce minds? Research shows that the brain’s electrical energy fields are intimately related to the mind. Every neuron generates an electrical charge, including a small energy field that radiates around the cell. Billions of neurons, organized in pathways and systems, generate much stronger fields. Most scientists think these brain energies and mind are identical. In this dominant view, physical brain energy and mental energy are two aspects of the same thing. On the other hand, a few scientists still adhere to traditional dualism, which holds that brain energies and mind are separate, but very closely related. Neither view has been proved or disproved. We’ll return to this question in Essay 7; for our purposes here it won’t matter. What we do know is that your brain’s neurons, pathways, and systems generate electrical energy fields, which are intimately related to your mind. Your brain is enchanted. And your reticular system is its enchanted core. The reticular system (or reticular formation) is in fact the oldest part of the brain. It’s a heritage from the earliest vertebrate animals – primitive sea creatures, ancestors of codfish, lizards, and humans. Like other body organs, the human brain evolved from simpler brains in lower animals. In this evolution, new pathways were added in layers on top of the old. In the older layers, most pathways were preserved, along with their major functions. The brain has been compared to an onion, with newer layers surrounding older ones, or to a geological rock formation, with older strata more deeply buried. So among our distant ancestors were these worm-like sea creatures, with brains that were just loose networks of nerve cells. As higher animals evolved, those loose networks were preserved as the brain’s core. Our human reticular system still consists of many diffuse, interwoven neural networks. We’ll look at them more closely in the next section. As those first worm-like vertebrates evolved into fish, the core was preserved, but new pathways and systems were added. Later as amphibians evolved, and then reptiles, still more pathways and systems evolved with them. The result was the reptile’s brain, fully equipped with basic animal instincts. Our brainstems reflect this heritage. 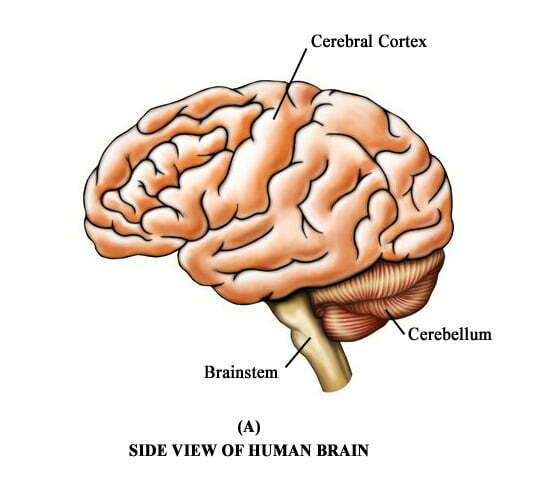 A human brainstem is quite similar to a reptile’s brain. Sometimes called our “reptilian brain,” it still controls the same instinctive functions. It underlies simple sensory and body awareness, instinctive drives, and visceral regulation. Here are mostly hard-wired programs for fight-or-flight, hunger, thirst, sexual drives, and other bodily functions. As reptiles evolved into mammals, a new brain level was added. The limbic system is well-developed in all mammals living today, including humans. Often called the “emotional brain,” it plays a central role in mammals’ social emotions. It determines how we interact with other members of our species. In humans, the limbic system underlies our feelings about others, positive and negative, and their expression in our personal relationships. The cerebral cortex is rudimentary in reptiles, and remains small in most mammals. It expanded with the evolution of monkeys and apes, then mushroomed in human evolution. It’s where we do our thinking. The cortex contains programs for speech and language, abstraction and calculation, tool-making and artistic expression. It greatly expands our memory and gives us our unique human intelligence. The cerebellum evolved along with the rest of the brain. It contains three major evolutionary layers, interconnected respectively with the brainstem, limbic system, and cerebral cortex. At all levels, the cerebellum is basically a balance system. It balances, coordinates, and integrates the activities of other systems. More on the cerebellum in Essay 2. More on the brainstem, limbic system, and cerebral cortex in Essay 3. But all those systems evolved from the reticular core, in which they remain rooted anatomically and functionally. The ancient core networks remain central to brainstem, limbic, cerebrocortical, and cerebellar functions. The reticular system runs lengthwise through the center of the brainstem. At its lower end it extends to the spinal cord. At its upper end it splits in two major branches, one projecting diffusely throughout the limbic system, the other throughout the cerebral cortex. Another major branch projects similarly to the cerebellum. Neurons in the reticular system are organized differently than in the rest of the brain. In other brain regions, they are organized in well-defined pathways, and the interconnections among these pathways are precise. In the reticular system, neurons are more loosely organized. They appear almost randomly arranged in intertwined networks (the word reticular means “netlike”). “Think of a net in three dimensions and you have a mental picture of the reticular formation,” says neurologist Richard Restak. This net actually consists of many networks, diffusely interwoven, each containing thousands of interconnected neurons. Many of these neurons are highly branched, and project in all directions throughout the core. Many reticular neurons receive signals from, and transmit signals to, thousands of other neurons. So reticular neurons form very complex, three-dimensional, lattice-like networks – many such networks, interwoven and diffusely interconnected. Through these networks flow the central energy currents of consciousness. In other brain regions, each distinct, well-defined pathway transmits a specific kind of information. In the reticular system, processing patterns are much less distinct and differentiated. Here all kinds of signals converge, mixing and merging, losing their specific information value in the diffuse networks. Signals flow through the core in non-specific streams and waves, their currents in constant flux. Reticular processing is remarkably fluid. As the diagram suggests, the reticular system’s connections with other brain regions are also diffuse – more like sprays than pathways. Millions of neurons project in fanlike arrays, transmitting impulses from the core to all brain regions, while millions of others funnel information back into the core. The term “reticular system” properly includes the brainstem core (reticular formation) as well as its diffuse neural projections. The great neuropsychologist Alexander Luria called the reticular system “the first functional unit of the brain.” It is indeed – it’s the evolutionary, anatomical, and functional core of your brain. The reticular system appears randomly organized, but there is some order in its neural tangles. It contains many different networks, each with its own set of functions. Its processing patterns are highly fluid, but they are patterns, determined by the interactions of its many interwoven networks. Its best-known function is control of sleeping, dreaming, and waking. Many networks, located in various parts of the core, participate in this global regulation of consciousness. Some of them activate the brain, generating waking awareness and arousal. They determine background activation levels, from drowsy and lethargic to fully alert and active. Other networks are inhibitory; they deactivate the brain and produce deep sleep. And still others regulate the paradoxical activation/deactivation patterns of dreaming or REM sleep. Scientists are still mapping the tangled reticular networks, still learning how they interact to produce these states of consciousness. Because of their complexity, our picture is still sketchy. As one scientist put it, “a wide chasm of unacquired data” still separates us from any detailed understanding of how these networks function. The reticular system also controls the selective spotlight of attention. It’s clear that many networks contribute to this focused awareness. Some generate and direct the focus. They selectively activate specific pathways in other systems, as attention’s spotlight shifts from one sensation, feeling, or thought to the next. Other networks inhibit or suppress irrelevant signals – attention’s well-known “filtering” function. Here again, we know some of the networks involved, but still don’t know most of the details. One thing we do know is that anything new triggers reticular attention. All vertebrates, from fish to humans, respond selectively to novel stimuli. This immediate interest in anything new is one of our oldest brain programs, part of the reticular program for controlling attention. Scientists have identified some of the networks involved. The reticular system is also central to body regulation. It’s the core of all visceral control systems. It is particularly important in the “vital functions” of respiration, heart rate, and blood pressure. More than any other brain region, the reticular system is essential for life. People can live after damage (for example, from strokes or trauma) in most brain regions, but usually not after damage to the vital core. The reticular system also plays a central role in motor (movement control) functions. Motor programs in other systems control specific movement patterns, from simple reflexes to complex skills, but core networks activate them all. They are the central source of drive, motivation, and will. Finally, the reticular system is central to pleasure and pain processing. Its so-called “reward” and “punishment” networks activate approach and avoidance drives, good and bad feelings, positive and negative emotions at all brain levels. We’ll trace that out in Essay 4. The point here is human nature is built on this positive-negative duality, programmed in the brain’s core networks. Again, our maps are incomplete and our knowledge is limited. But we do know that many – maybe most – reticular networks participate simultaneously in two or three or more of the functions listed above. And multiple networks may be so interconnected that clear distinctions among them and their functions are impossible. Core networks have many different functions, but all are mixed and merged. Compared to other brain systems, reticular processing patterns are diffuse, undifferentiated, and highly fluid. Signals flow through the core in streams and waves, their currents in constant flux. At the time this was a radical idea. The traditional dogma was that older brain regions are not conscious. Consciousness occurs only in the cerebral cortex, and probably just the human cortex. Lower animals, like fish and reptiles, are certainly not conscious, and that cat on the porch probably isn’t either. But over the years this attitude has softened considerably. There’s no proof (consciousness is entirely subjective and so very difficult to investigate), but most scientists today believe there is a continuum of consciousness. It’s most highly developed in the human cortex, but even our brainstems underlie basic sensory and body awareness. Brainstem creatures, like lizards and fish, probably have simple sensory awareness. There is no clear end point, and many even suspect that consciousness extends beyond brains, perhaps as part of a universal life force. In this emerging view, reticular awareness may take various related forms. We experience it as a sense of newness, as intuition, as existential awareness, and as spiritual awareness. Each of these involves at least a spark (sometimes much more) of that simple consciousness-without-content or pure awareness. So the sense of newness, as noted earlier, is programmed in reticular networks, part of the reticular program for controlling attention. All vertebrates, from fish to humans, respond selectively to novel stimuli. When something new catches your attention, you feel a spark of awareness, a split-second sense of its newness. This immediate interest in anything new is programmed in your core. Intuition builds on that sense of newness. It refers to hunches, insights, and inspirations, each accompanied by a spark or flash of intuitive awareness. From deep within comes the “aha” or “lightbulb” experience, ranging in intensity from the glimmer of a hunch, to the flash of creativity, to the illumination of a revelation. But it always involves this spark of awareness – the non-specific signal of something new. Existential awareness also reflects the core’s undifferentiated processing patterns. Here is an undifferentiated sense of existence, or simple being. It’s the “core of your being” experience. Here’s your inmost self-awareness, a most basic sense of being alive. Spiritual awareness is closely related to existential awareness; it has been called “existential awareness plus awe.” And it’s closely related to intuition – in all religions, God communicates with us through intuition. Spiritual awareness is experienced most fully in deep prayer and meditation. These take you to your core, to a sense of the infinite, to your sense of a soul. The notion of a spiritual center, at a deepest psychological level, is a major theme in most religions. Although concepts like “center” or “depth” are just metaphors when applied to the mind, they are powerful metaphors, undoubtedly rooted in brain structure and function. So every person has a spiritual core, an inner sanctum of the soul. The kingdom of heaven is indeed within. Here’s the center of the turning wheel. Here’s the Self in the depths of the self, the core of pure Being. Penfield was a neuroscience pioneer who challenged the conventional view that consciousness is limited to the cerebral cortex. In 1950 he coined the term “centrencephalic system,” referring primarily to the reticular core. Its diffuse networks, he maintained, probably generate core awareness – a deepest, unifying “substratum of consciousness” in which all other experience is rooted. Penfield was widely respected, and for a few years his view of the centrencephalic system was influential. But it was also scientific heresy. Again, the orthodox view was that older brain regions are not conscious. The resulting controversy continues, to some degree, even today. So evidence supporting Penfield’s view was attacked and his reasoning was questioned. By the late 1950s, the orthodoxy again prevailed, and the “centrencephalic system” gradually disappeared from scientific discussions. It was replaced by a more conservative and circumspect view of the reticular system. In particular, consciousness was not attributed to the core itself. For decades, despite intense scientific interest in reticular activation of consciousness in the cerebral cortex, there was almost no discussion of possible core consciousness. But some independent thinkers still wondered about that. And despite the effective blackout, their speculations did occasionally make it into the scientific literature. For example, Ralph Gerard’s 1957 comment about “simple awareness” (see previous section) was typical of those who thought the possibility at least deserved to be mentioned. Rinsley maintained that all other aspects of the self – specific body sensations, body image, all feelings and thoughts about oneself – are processed in non-reticular brain regions. But all are rooted in the core. The sense of self is built on this existential foundation. Most of the time, Rinsley said, such core awareness is barely conscious, just a subliminal backdrop to the usual stream of sensations, feelings, and thoughts. But in certain situations, for example the twilight state experienced just before falling asleep, core awareness may predominate. That’s also the case, he said, in meditation and mystical states. Awareness becomes more or less centered in the core itself. Here is “primal, pre-boundary self-awareness.” Here space, time, and even individual identity dissolve in the eternal now. It’s what Freud called “the oceanic feeling” – fluid, formless, and vast. These scientists and philosophers were among the first to write about possible core consciousness. There weren’t many of them in those early years. They faced strong skepticism, even censure, as everyone knew that only the cerebral cortex was conscious. Many researchers are now mapping the reticular networks and untangling their various functions, including their likely roles in core awareness. One of the most prominent is neurologist Antonio Damasio. He distinguishes two basic forms of consciousness: core consciousness and extended consciousness. According to Damasio, this is basically body awareness. He emphasizes the strong visceral input into the reticular system. Sensory information from all internal organs feeds into the core, where it’s intermixed and processed together. It is experienced, he says, as “primordial feelings” — the basic stuff of core consciousness. But again, extended consciousness “is built on the foundation of core consciousness.” It’s generated by core consciousness, without which extended consciousness cannot exist. Damasio’s views are based largely on studies of neurological patients with lesions in various reticular networks. As noted earlier, most of those patients do not survive. But some do, with various subtle or dramatic disturbances of consciousness. Many other neuroscientists, also studying similar patients, have reached similar conclusions. There is now growing support for the “core consciousness” concept. Another group of patients also shed light on the subject. They are children born without a cerebral cortex. These children often die in infancy, but in some cases may live several years, always with extreme psychological limitations, and usually with other medical problems. In the past they were thought to be in a completely unconscious “vegetative state.” Any behaviors or expressions which seemed to suggest even minimal awareness were just dismissed as unconscious reflexes. The most intensive recent research has focused on the “extended reticular thalamic activating system” (ERTAS). Still keeping this simple, and avoiding technical terms, you’ll get the gist by referring to Diagram C on page 5. “ERTAS” is basically the upper brainstem branch of the reticular core that connects with the cerebral cortex. Some of its networks project diffusely throughout the cortex. The reticular system’s ERTAS branch is the functional hub of the cerebral cortex. So here’s the central pith, the activating core of human intelligence. It’s easy to understand why so many scientists have been inspired to study this system. The literature is full of emerging insights and intriguing theories about ERTAS and its functions. Here we’ll just note its likely role in core consciousness. Most researchers emphasize two-way re-entrant loops of electrical activity interconnecting the reticular core and cerebral cortex. Many millions of reticular– cortical–reticular circuits activate what we loosely call “cortical” functions, but the reticular system is equally involved. It cannot be dissected out of the consciousness loop. Again, these reverberating bioelectric circuits, millions of them, always active and in constant flux, are the basis of human intelligence. The reticular system is the core of that intelligence. Again, specific contents of consciousness are generated elsewhere in the brain, while “C” is generated in the reticular core. As noted earlier, speculation about the reticular system’s role in meditation began a few decades ago. The idea was that deep meditation activates the reticular core and deactivates other brain systems. More recent research supports and refines that notion. And we now know that reticular networks generate the characteristic EEG brainwave patterns of meditation. During deep meditation, the entire brain resonates with rhythmic electrical patterns (primarily alpha and theta rhythms), which are generated in certain core networks. These core brain rhythms spread throughout the brain and can be recorded outside the skull by an EEG. It’s now clear that the reticular system plays a key role in meditation. In summary, the idea of reticular consciousness is still speculative, but it’s increasingly supported by scientific evidence from various sources. Web searches like “reticular system and spirituality” bring up colorful jumbles of facts and opinions about brains and souls, chakras, energy fields, yoga, and so on. Some is too far-out, and easily dismissed, while some is more insightful and intriguing. A generic label for these websites might be “programming your reticular system.” The authors range from spiritual teachers (all faiths but mostly Christian) to psychotherapists to marketing consultants. Their common focus is the reticular system’s control of attention – its strong and largely unrecognized control over everything we experience. Many mention the “cocktail party effect.” In such crowded and noisy settings, someone across the room may quietly mention your name – your reticular system immediately “tunes in” to that conversation, while filtering out dozens of others. Similarly, a mother may sleep through all kinds of noise, but wakes when her infant in another room barely whimpers. And all emphasize that a positive mindset – or “positive reticular programming” – leads to more success than a negative mindset. On a deepest level, they say, paying attention to good things brings good things to you. The point is that the reticular system can be programmed, and how it’s programmed is important. In all of us, it’s biologically programmed to notice things that are emotionally charged – positive or negative – as well as anything new. It’s also programmed through learning; experience teaches us to focus on what’s important. Finally, we can program the core ourselves, by training ourselves to focus on things that enhance our lives. From a much different perspective, some marketing consultants speak of “hooking the reticular system” to focus on ads. For example, the most effective ads trigger both positive and negative emotions (e.g. fear of missing out on something good). They should be “as personalized as possible.” And of course anything labeled NEW grabs directly at the core. Tiffany Barsotti, a theologian associated with the Unity Church, attempts to integrate neuroscience principles with “ancient esoteric teachings.” Her main focus is the reticular system, which she relates to the Alta Major Chakra. Chakras are traditional spiritual energy centers, usually associated with various body organs. The Alta Major Chakra is particularly involved in cosmic consciousness and enlightenment. Eugene Shea views the brain from a systems analytic perspective. He says the reticular system is its “command and control system.” It meets all criteria for such a system – immediate access to all incoming information, a full range of response options, and two-way communication with all other systems. The cerebral cortex is often considered the brain’s “executive system,” as it directs and controls other systems. But as Shea (and many neuroscientists) point out, the brain’s primary control center is actually its core. Shea is also a devout Catholic, and views the brain from that perspective as well. He believes that humans have immortal souls, separate from our brains. The soul connects with the brain through the reticular system. The brain’s “command and control core” also provides direct access to Spirit. Sutapas Bhattacharya is a British scholar and expert in both Eastern and Western philosophical traditions. He asserts “beyond all reasonable doubt given the overwhelming evidence supporting it,” the reticular system is the basis for spiritual experience in all religions. Bhattacharya maintains that all major religions provide paths to Enlightenment. But certain Hindu philosophies, he says, best reflect the underlying spiritual reality. The basic idea is that unchanging Spirit lives in each of us, but is usually obscured by ever-changing sensations, feelings, and thoughts. This brain process is basically the same in all people, in all cultures and all religions. Thus, Bhattacharya endorses the perennial philosophy – the “unity of faiths” idea. In their deepest roots, all religions are the same. Each has its own beliefs and practices, but all cultivate core awareness. We argue and fight about beliefs and practices, but these are superficial and trivial compared to the vital core experience, which we all share. That’s an important point, and worth repeating. The idea of reticular consciousness doesn’t support any one religion over others. Every religion has its mystical branches and meditative traditions, and the core spiritual experience is the same in all of them. In each we find individuals devoted to the life of the soul, more or less centered in deep spiritual awareness. Each has his or her own beliefs and practices, but all cultivate the same basic core awareness. So in conclusion, this essay has focused on the brain’s reticular system and its likely role in spiritual experience. In this view, spiritual experience is a core brain function. Is your soul nothing more than brain electrical patterns? When your brain dies, does your consciousness, your spiritual essence, die with it? Is God just a reticular illusion? Or are there spiritual dimensions that go beyond brain functions? Of course, no one really knows. But modern physics provides reasons to suspect that a universal mind, with which individual brains and minds are connected, does exist. Our lives probably do have magical dimensions. Spiritual experience probably involves much more than just brain functions. We’ll explore all that in Essay 6. Page 1 – Consciousness is impossible to define precisely, and sometimes confusing academic distinctions are made among different types of consciousness. It’s used in these essays with its common meaning of awareness or sentience, as experienced during normal waking or in dreams. Page 2 – Pathways consist of nuclei and cortex (gray matter) and the tracts (white matter) that connect them. See any introductory text or website for details. 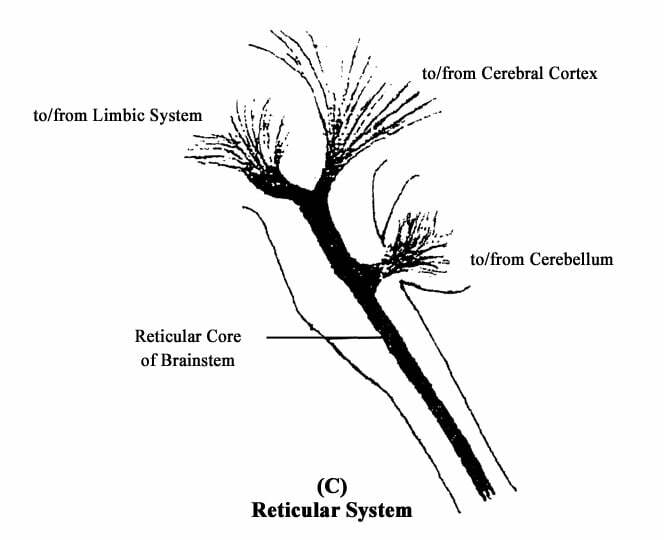 Page 7 – Historically the reticular core was considered a single undifferentiated neural network (a reticulum). But gradually many different networks were identified, each with its own set of functions. Some are partially differentiated into pathways (nuclei and tracts), although many of these are indistinct and intermingled with other networks. Because it’s not just one undifferentiated network, some researchers suggested the term “reticular system” is misleading. It “has outlived its usefulness,” they said, and should be dropped. It should be replaced by more precise references to specific core regions or networks. Page 9 – In 2012, a number of leading neuroscientists signed the Cambridge Declaration on Consciousness, asserting that consciousness is not limited to humans. In fact, they asserted, it’s probably present in most animals, even insects. These scientists maintain that lack of a cerebral cortex “does not appear to preclude an organism from experiencing affective states.” In other words, even animals with much simpler brains probably have some basic emotional and body awareness. However, it’s worth noting that declarations are not proofs. Despite all the knowledge and common sense supporting the Declaration, there’s still no way to prove that your dog or cat is conscious. Page 11 – Penfield’s “centrencephalic system” was intentionally vague, referring mainly to the reticular core but not limited to it. Those were the early days of brain-mapping, and Penfield viewed it as a provisional concept, to be modified with future knowledge. Page 12 – Freud borrowed the term “oceanic feeling” from a colleague. It refers to a sense of limitlessness and oneness with the universe, common to most religions. He recognized the feeling as real, experienced by millions of people worldwide – not just a matter of faith. However, he claimed to have never experienced it himself, and failed to appreciate its positive aspects. He interpreted it as just a regression to infantile emotions, presumably experienced before the development of psychological boundaries and distinct sense of self. Page 14 – Damasio describes reticular networks as the primary generators of core consciousness, as does Merker (also p. 14) in discussing “consciousness without a cerebral cortex.” However, both speculate that a few other (also older) brain regions may also be involved. Page 16 – Bogen identified certain reticular (ERTAS) networks as likely substrates for “C.” Many researchers agree. But others focus on other networks, including some in the lower brainstem core. Of course, it’s likely that many networks throughout the core are involved in core consciousness. Barsotti, Tiffany. A Proposed Spiritual Axis of the BodyMind. www. holosuniversity. org/content/uploads/files/dissertations/ Barsotti.Thesis.pdf, 2010. Bhattacharya, Sutapas. The Synthesis of Science and Spirituality. www.sutapas.com, 2014. Bhattacharya, Sutapas. The Brainstem Brainwaves of Atman-Brahmin. Gyan Publishing House, New Delhi, 2015. Bloomfield, Harold. Transcendental Meditation. Dell, New York, 1975. Bogen, Joseph. Some Neurophysiological Aspects of Consciousness. SeminNeurol, 1997. Buber, Martin. I and Thou. Trans Walter Kaufmann. Charles Scribner’s Sons, New York, 1970. Cambridge Declaration on Consciousness. University of Cambridge. www. fcmconference. org/img/ CambridgeDeclarationOnConsciousness.pdf. Campbell, Anthony. Seven States of Consciousness. Harper and Row, New York, 1974. Chaudhuri, Haridas. Integral Yoga. C. Trinling and Co., Liverpool, 1965. Cober, Harold. Universal Reality. Luthers, New Smyrna Beach FL,1994. Cutsinger, James. In Christianity: The Complete Guide, ed.John Bowden. Continuum Press, London, 2005. Damasio, Antonio. The Feeling of What Happens: Body and Emotion in the Making of Consciousness. Harcourt Brace, New York, 1999. Damasio, Antonio. Self Comes to Mind: Constructing the Conscious Brain. Vintage Books, New York, 2012. Gerard, Ralph. Final Summary. In Reticular Formation of the Brain, ed. H. Jasper, L. Proctor, R. Knighton, W. Noshay, and R. Costello. Little, Brown, and Co., Boston, 1958. James, William. The Varieties of Religious Experience. Simon and Schuster, New York, 1977. Koestler, Arthur. The Ghost in the Machine. Hutchinson, London, 1967. Maharishi Mahesh Yogi. Transcendental Meditation. Signet, New York, 1968. Mashour, George and Alkire, Michael. Evolution of Consciousness: Phylogeny, Ontology, and Emergence from General Anesthesia. Proc Natl Acad Sci USA, 2013. Merker, Bjorn. Consciousness without a Cerebral Cortex: A Challenge for Neuroscience and Medicine. In Behavioral and Brain Sciences. Cambridge University Press, 2006. Merton, Thomas. The Inner Experience. Harper Collins, New York, 2003. Mountcastle, Vernon. Medical Physiology. C. V. Mosby, St. Louis, 1968. Noback, Charles. The Human Nervous System. McGraw-Hill, New York, 1967. Ouspensky, P.D. Tertium Organum. Random House, New York, 1970. Parvizi, Josef and Damasio, Antonio. 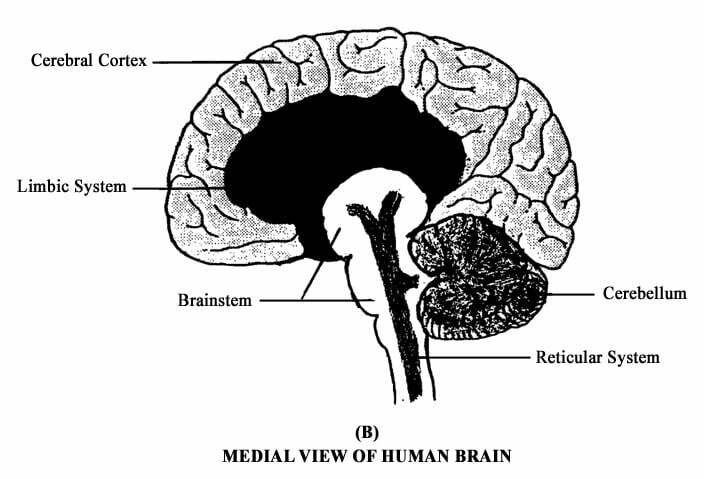 Consciousness and the Brainstem. Cognition, 2001. Penfield, Wilder. In Jasper, H: The Centrencephalic System. Can Med Assoc J, 1977. Penrose, Roger. The Emperor’s New Mind. Oxford University Press, New York, 1989. Ram Dass. Be Here Now. Lama Foundation, San Cristobal NM, 1971. Restak, Richard. The Brain: the Final Frontier. Warner books, New York, 1979. Rinsley, Donald. A Contribution to the Theory of the Ego and Self. Psychiatric Quarterly, 1962. Scheibel, Arnold. Anatomical and Physiological Substrates of Arousal: A View from the Bridge. In JA Hobson and MAB Brazier (eds), The Reticular Formation Revisited. Raven Press, New York, 1980. Shea, Eugene. How the Brain Works: Coherently! www.j.b5z.net/i/u/2043019/f/HowThe BrainWorks.pdf. Shea, Eugene. The Immortal “I”. University Press of America, Lisle,IL, 1991. Sherrington, Charles. The Integrative Action of the Nervous System (1906). Charles Scribner’s Sons, New York, 1947. Von Franz, Marie-Louise. Carl Gustav Jung: His Myth in Our Time. G. Putnam’s Sons, New York, 1975. Young, J.Z. Programs of the Brain. Oxford University Press, New York, 1978. Zeman, Adam. Consciousness: A User’s Guide. Yale University Press, New Haven, 2002.